1. Fry the pork and pepper for 2–3 minutes until browned. Add the kidney beans, cover and cook for 10 minutes, stirring occasionally. 2. Meanwhile, mix the tomatoes, mashed avocado, chilli sauce and mayonnaise together and season. 3. Heat the tortillas according to pack instructions. 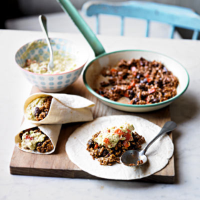 Divide the mince between them, top with guacamole, roll up and serve.